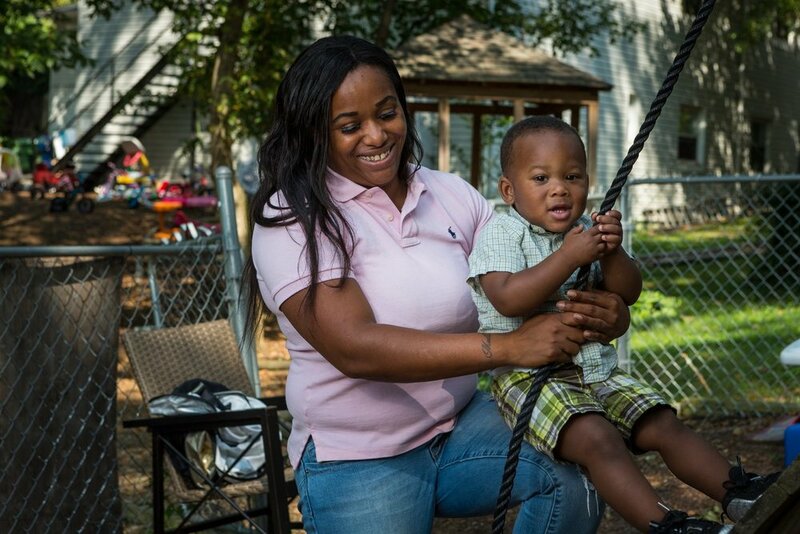 Steadfast House is transitional housing that gives hope, healing, health, and home to single women, mothers with children, and female veterans in need. Steadfast House provides our residents a fresh start and a place to heal surrounded and supported by Christian love, trust, education and companionship. Our mission is to provide stability to homeless women and moms with children; provide personal skill building for women; provide education and training that equip women for employment and sustainable housing; provide reintegration skills and opportunities that lead to greater self-determination. Short-term goals are established such as getting a GED, driver's license, finding child care, and learning to manage a household budget. As women grow, they are assisted with their long range goals, such as a new career path, education and permanent housing. ABCCM offers training and support in this rewarding relationship. Are you in need of shelter? Single women and mothers with children should call (828) 398-6920 to be placed on the waiting list. Veteran women only: Please call (828) 767-1687 to speak with a staff member. The veteran hotline is answered from 8 a.m. to 8 p.m., seven days a week. To serve with us, contact the volunteer coordinator at maia.price@abccm.org. Cook Teams: This opportunity is exclusively for volunteers who would like to form a team (2 or more people) and come serve a meal to our ladies. Our teams at SH provide the meal and serve it to our residents. At lunch we serve 15-20 residents and at dinner we serve 30-35 residents. Chaplain/Mentor: This is a chance to visit with our residents in an informal setting and provide spiritual support and discussion. House Garden: Spring is around the corner! We are looking for volunteers to help us develop our small garden program on their own schedule. There is also an opportunity to be a sponsor for our Garden Club at Steadfast House. Child Enrichment Teams: This opportunity is exclusively for volunteers who would like to form a team (3 or more people with one member being over 21) and provide supervision and playtime for our kiddos in the house during our evening programming while the Moms are attending classes or attending to other house matters. This is from 6:30 pm to 8:00 pm on weeknights. Steadfast Partners: We are looking for volunteers who want to work with our children in a more one-on-one context. Steadfast Partners are volunteers who can make a minimum of a 12 week commitment to serve on Tuesday evenings from 6:30 pm to 8:00 pm. Steadfast Partners also attend one Saturday training. Class Instructor: Almost all of our classes are led by volunteers and this is a unique way to interact with the residents. If you have a passion or a skill you would like to share, let us know! Administrative/Data Entry or Internship: This is a way to help the staff with paperwork, inputting data, and other office tasks. This opportunity can be used for school credit. Points Room Attendant: The points room is our in-house store. Volunteers in this area serve as points cashiers and help organize and restock with donations. Steadfast Partners: Serving in this way involves being consciously paired with a child in the program with whom you will be a supportive, caring, encouraging, patient, safe and consistent partner each week. You will eat dinner with the child’s family each week, and be responsible for one-on-one activities with the child. Those serving will be expected to review the program curriculum in advance each week to revise/supplement activities as needed to fit their child’s individual needs. Please note that Partners must be able to commit to the program two hours a week for a minimum of 12 weeks.